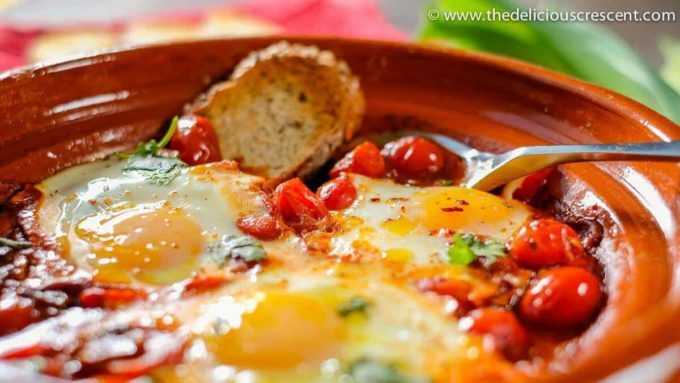 Moroccan eggs in tomato sauce is a healthy comfort dish that is so easy to prepare. It is a tasty option for brunch or any other meal of the day. Here I show you how to make it in a traditional Moroccan tagine, but it can easily be prepared in a regular pan too (video below). 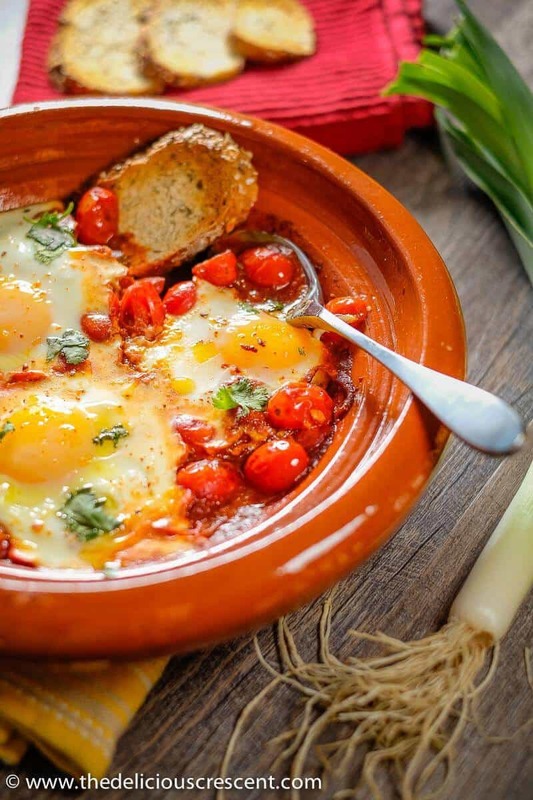 Shakshuka is a simple and delicious dish of eggs that are poached in a nicely spiced tomato sauce that is cooked with onions, chili peppers and garnished with some herbs. It is north African in origin, although some reports say that the popular version may be specifically from Tunisian cuisine. Nevertheless, it is a dish now common in north Africa, the Levant and some middle eastern countries. Although it is often served at breakfast or brunch, it can be a quick meal for any time of the day. 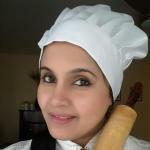 Some tomato based recipes on the blog are: Hyderabadi tomato curry with eggs, Kebab Kofta Masala (Meatball Curry), Khoresht Kadoo (Persian Zucchini Stew), and Spicy rosemary tomato chicken. Some popular egg recipes on the blog are: Persian Zucchini Kuku (Persian Zucchini Frittata) and Spinach Kale Egg Mushroom Birds Nests. The most recent dietary guidelines exclude a cholesterol limit. So, eggs are making a comeback. Eggs have had a bad reputation as they are a rich source of dietary cholesterol. However, research has shown that dietary cholesterol does not have a huge impact on blood cholesterol levels. For only about 70 calories, eggs are an excellent source of high quality protein and contain mostly unsaturated fat. The antioxidants lutein and zeaxanthin in eggs are protective for the eyes. Eggs are also a good source of choline. Evolving research shows an important role for choline in brain development, nerve and liver function as well as in heart health. Eggs are very satisfying and keep a person full longer. So moderate consumption of eggs, such as one egg a day can be part of a healthy diet for normal individuals. Poaching is a healthy cooking method and this recipe uses a low amount of fat. It is a method that does not result in formation of inflammation causing compounds unlike the high temperature cooking methods such as grilling and frying. I have also added in some leeks which are an excellent source of vitamin K. Like the other allium vegetables (onions and garlic), leeks are a rich source of cardio protective and cancer-preventive flavonoids and sulfur containing nutrients. 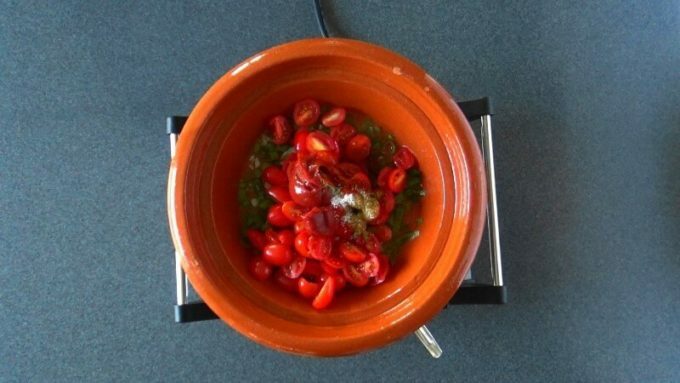 I have discussed about tomatoes in my post about Kofta Kebab Masala. Although I have prepared this dish in a Moroccan tagine, it can also be made in a regular pan. And in fact works great in a cast iron skillet. 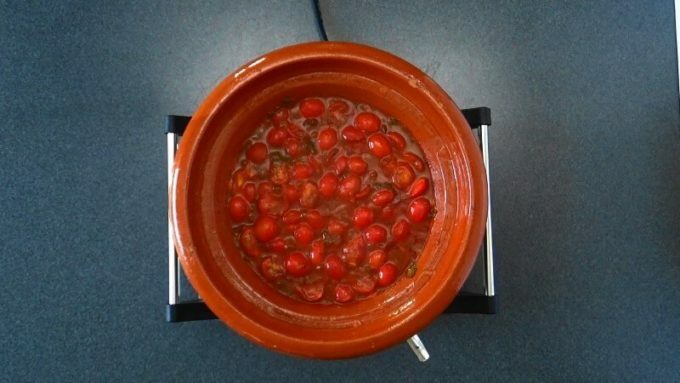 After adding the eggs to the tomato sauce, it can also be transferred to the oven to finish baking it at 400 degrees F for 6 to 10 minutes depending on how well done you like your eggs. Check it out to see what time works best in your oven. I like the way eggs set when they are baked. The colors are more vivid and the texture is also so good. Cooking with a tagine is so much fun and it gets better with practice. The earthenware retains heat and also condenses the steam and adds it back to the dish. 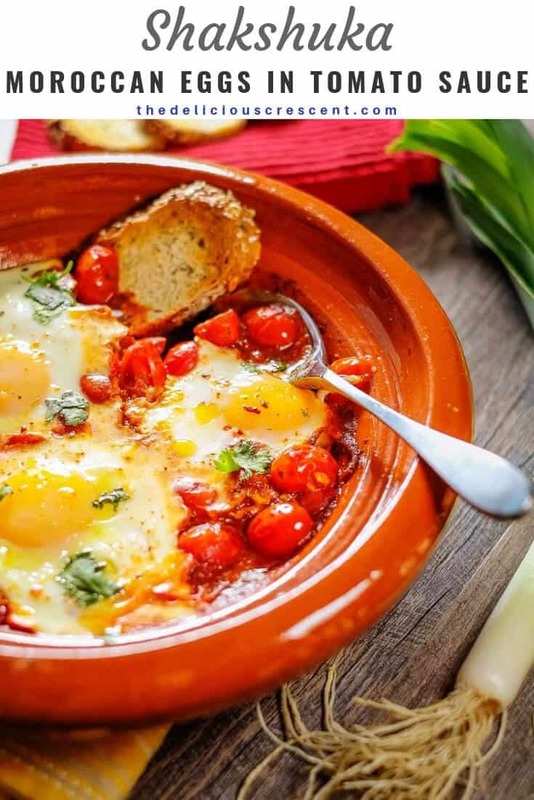 Go ahead, start your morning with Moroccan eggs in tomato sauce! 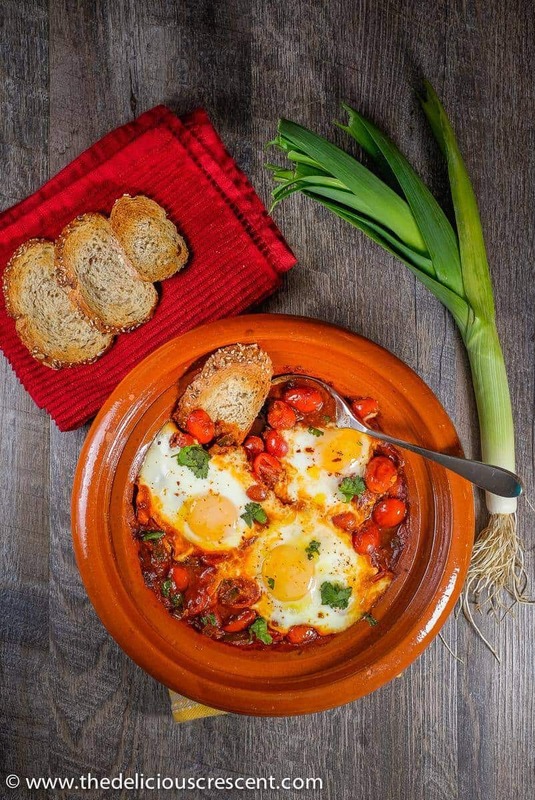 Moroccan eggs in tomato sauce is a healthy comfort dish that is easy to prepare. It is a tasty option for brunch or any other meal of the day. The instructions below are for either cooking with a Tagine (Moroccan earthern pot) or a regular frying pan. 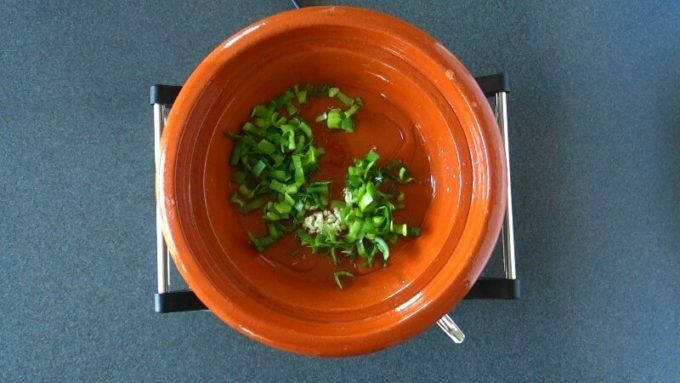 Take a tagine and put the olive oil, chopped leeks, grated garlic and about one fourth cup water and place it on a heat diffuser set over a stove and cook over medium to low medium heat for about 10 to 15 minutes. If using a frying pan, heat olive oil and sauté the chopped leeks or red onion, grated garlic and about one fourth cup water and let is simmer for about 5 to 10 minutes. Add the tomato paste, chopped tomatoes, spices, salt, pepper, sugar and let it simmer for additional 5 to 10 minutes. Adjust the consistency of the sauce by adding 1-2 tablespoons water as needed, until it is like thick pasta sauce. When simmering make sure to place the tagine top or lid as applicable. Crack the eggs into the sauce. Cover the dish with the tagine top or lid and poach the eggs for about 5 to 6 minutes until the eggs are well set. Season with salt and pepper to taste. Garnish with chopped cilantro or parsley. Transfer the dish to a dry wooden surface. 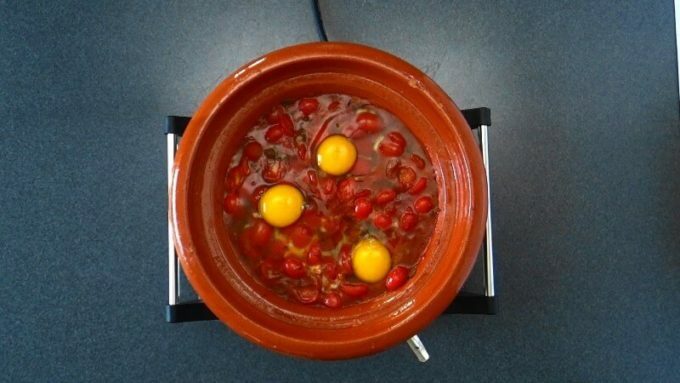 If using a tagine to prepare this dish, remember that the heat from the hot tagine (earthern pot) will continue to cook the eggs even after removing the dish from the stove, so you may turn off the stove and transfer the dish before it reaches your preferred final consistency for the eggs. Let it rest for 3-5 minutes and it will be as you desired. 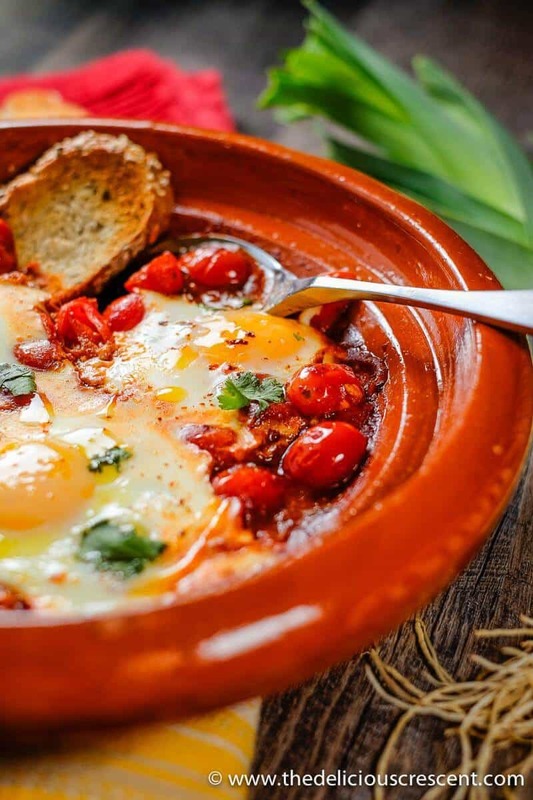 Serve these Moroccan eggs in tomato sauce with toasted bread of your choice. I prefer thick Mediterranean style flat breads. Such a beautiful dish. Sure to impress guests. Eggs are such a good source of protein. Thanks Ellen. Totally agree with you. So right off the bat, I’m a savory not sweet breakfast person. Eggs are of course, a mainstay. I love the flavors you’ve assembled here and my only issue is getting the fork through the screen. :) :) Thank you Lisa. You are sweet. I grew up with a lot of savory breakfasts. Although I have a sweet tooth, I agree with you – starting the day with savory nourishing breakfasts more often is a good thing. This looks absolutely delicious! And I love all the colors – it would be such a wonderful brunch! Thanks Patty. Yes its ideal for brunch. I make it often on weekends. What a beauty of a dish for breakfast!! Yum!! Shakshuka has been on my list of new things to make for a LONG time, so the timing of your recipe is perfect. I’ll be making this soon! I agree with you: eggs have gotten a bad rap, as has cholesterol (our body needs the stuff, hello?!). Overall, this dish is packed with healthful foods. AND it’s beautiful! Thank you Michelle for your insight. Indeed its such a simple and tasty dish. I make it all the time. Here I tried a small twist with leeks and grape tomatoes and loved it.